Most of us prefer not to turn computer off while we are away for coffee or going to the lavatory or have to attend a meeting in a conference room next door. Introducing Active Screen Lock, the unique security application, that disables Windows system key combinations, such as Alt+F4, Ctrl+Alt+Del, Alt+Tab and WinKey and then shows security screen over your desktop that would not let anyone except you in! Download the FREE trial version now! ...... That is the point where an average computer system is most vulnerable to felon's attack. The guy just has to have a glance at your monitor and he has it all! Introducing Active Screen Lock, the unique security application by DMVSoft, allowing you to do whatever you want to do when you are away from the computer without having to worry a second. 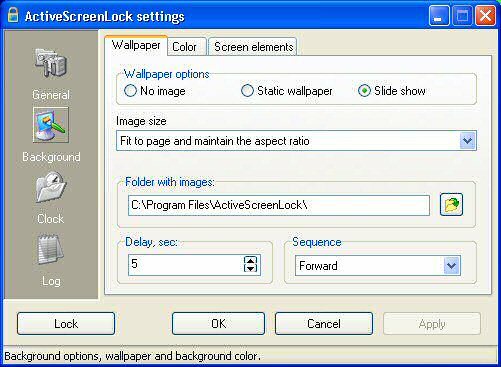 Active Screen Lock operates as follows: first it disables Windows system key combinations, such as Alt+F4, Ctrl+Alt+Del, Alt+Tab and WinKey and then shows security screen over your desktop that would not let anyone except you in without the proper password. Once the system keys are disabled, it is not possible to switch to another application, run a program or try to kill Active Screen Lock window using Task Manager. Qweas is providing links to ActiveScreenLock 2.82 as a courtesy, and makes no representations regarding ActiveScreenLock or any other applications or any information related thereto. Any questions, complaints or claims regarding this application ActiveScreenLock 2.82 must be directed to the appropriate software vendor. You may click the publisher link of ActiveScreenLock on the top of this page to get more details about the vendor.